Before Renewal by Andersen® opened for business in 1995, the reputation of the door and window replacement industry was far from perfect. Some companies were notorious for high-pressure sales tactics, price gimmicks and unsatisfactory services. This is why we’ve been on a mission to improve the status quo since day one. We believe homeowners deserve better experience every step of the way. You begin the process by visiting our showroom or setting up your in-home consultation at a time convenient for you. Either way, our experienced and courteous representative will be happy to talk about your needs, capture your vision and offer sound recommendations. Our design consultant and project technician will evaluate your existing frame openings and consider key factors that affect the performance of doors and windows. We’ll answer your questions, ease your concerns and explain your options to help you make an informed decision. If you’re ready to move forward, we’ll write up your order so we can begin custom-manufacturing your replacement units according to your exact specifications. We’ll h andle everything, including obtaining the necessary building permit. Renewal by Andersen’s door and window installation is perhaps the least inconvenient home remodeling project you’ll ever deal with. Equipped with the necessary tools, Certified Master Installers are prepared for all structural challenges to keep disruption and mess to a minimum. We observe the highest level of proficiency to carry out the job faultlessly the first time. Professionalism is in our DNA, which is why we have an outst anding Better Business Bureau record. We back our products with robust warranties. In the event of failure due to defects in materials, manufacturing or workmanship, we’ll return to bring the quality back up to our high st andards. Each of our units comes with a unique ID number to make it easy for you to report the problem unit. 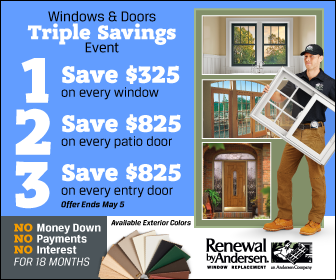 Renew your faith in window companies with Renewal by Andersen of St. Louis. Call us at (314) 332-2364 today to schedule your FREE, in-home consultation and estimate in St Louis, MO, or any nearby areas.